Week 6 of the NFL regular season schedule has been completed, giving us an even larger sample size to delve into just how each of the 2018 NFL Draft first-round picks has fared in their respective action so far. Some of the 32 first-rounders have not qualified for a grade either based on small snap counts or not playing altogether. On the other hand, some players have jumped out of the screen and have helped strengthen their teams. It had to happen sometime. After three terrific performances for the Browns, Mayfield struggled for the first time as a pro in his Week 6 game against the Chargers. It was business as usual for Mayfield when he worked from a clean pocket, as he completed 19 of his 35 attempts (which also included four drops) for 213 yards, one touchdown, four big-time throws and zero turnover-worthy plays. However, it was a different story when he faced pressure, as he completed just three of his 11 attempts for 25 yards, zero touchdowns and two turnover-worthy plays that both resulted in interceptions. Barkley put on a sensational performance in his team’s Thursday night game against the Eagles, which earned a game grade of 76.6, the second-best mark of his season to date. Barkley was the tackle-breaking, homerun-hitting threat that he was advertised as, forcing a total of 10 missed tackles on the night and racking up 96 rushing yards from breakaway runs (runs of 15-plus yards). He also added 99 receiving yards from 11 targets. 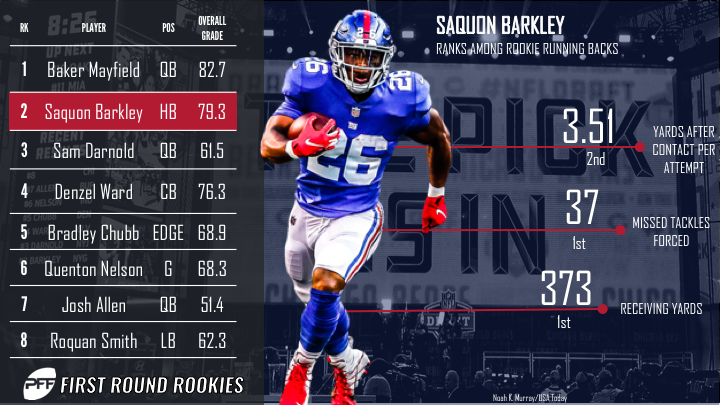 As good as Barkley has been over the last six weeks of the season, the Giants’ 1-5 record is a prime example of the fact that a generational running back can only do so much for a team. After looking very much like a rookie over the last few weeks, Sam Darnold looked anything but in his team’s Week 6 victory over the Colts. The first-year signal-caller looked fearless in the pocket and shrewd with his decision-making in what was undoubtedly the best performance of his young career to date, and he was truly exceptional from a clean pocket, where he completed 22-of-26 passes for 249 yards, two touchdowns and a passer rating of 132.2 – the fourth-best mark of the week. As we discussed last week, the Browns made the right choice by drafting Denzel Ward with the fourth overall pick of the NFL draft, and his performances on the football field are validating the team’s decision by each passing week. Through six weeks, Ward has played a whopping 449 defensive snaps, which is not only the most among rookie cornerbacks this year, it’s the most ever recorded by a rookie cornerback over the first six weeks of a season. All told, he’s allowed 23 catches from 45 targets for 264 yards, and he has yielded a passer rating of just 63.6 on throws into his coverage – the 11th best mark among cornerbacks this year. After a couple of quiet weeks, the Broncos first-round selection had a mightily productive Week 6 game, where he dominated as both a pass-rusher and held his own as a part of a struggling run defense. As a pass-rusher, he notched three sacks and three hurries on the way to career-best six total pressures, and he also tallied two tackles and a defensive stop against the run.